Prolific filmmaker Mario Monicelli’s 1963 masterpiece I Compagni, or The Organizer tells the story of textile mill workers in late-nineteenth century Torino who find the strength to protest working conditions thanks to the intervention of an itinerant, mild-mannered (and of course, bespectacled) intellectual vividly realized by Marcello Mastroianni. It’s a thoughtful and beautiful movie, as insightful as you might expect and funnier than the subject matter would suggest. 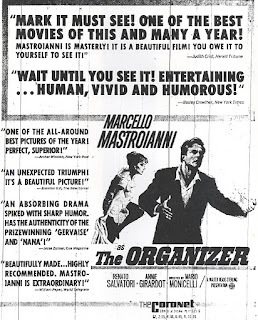 Who’s to say whether or not The Organizer has been forgotten — though it is undeniably rare: only 420 IMDb votes, and not one professional review (though IMDb does link to a superior long essay on the film by the wonderful Marilyn Ferdinand, here). It’s a shame, this is a film certain to please a broad constituency, whether fans of the principals, the Oscars (Best Original Screenplay nominee, 1965), foreign fare, labor movies, or merely great cinematography. It’s a serious film about a serious subject, and like real life itself, it moves smoothly (or awkwardly — depending on your point of view) from tragedy to comedy, brimming with the sort of humanity and struggle that transcends language. This is one of Mastroianni’s most subtle performances, and possibly his best. He punctuates his meekness and restraint with moments of pure charisma and wild abandon, and creates something very memorable. 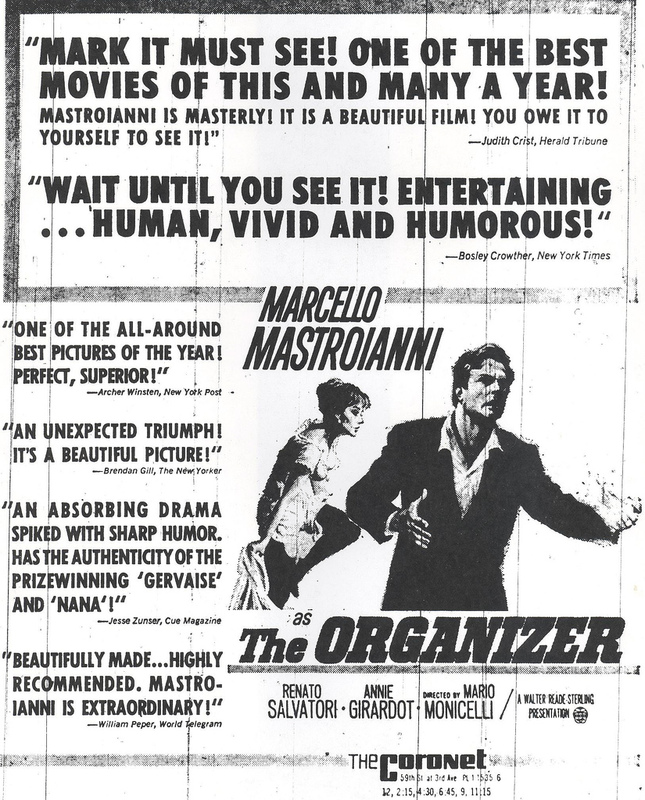 One note: the poster depicted here is a stinker — Matroianni sports a beard and glasses throughout, and The Organizer is hardly a sexual film, as the poster suggests. I’m want to keep my thoughts here very brief, but I did find one sequence in particular to be emblematic of the character of the entire film, demonstrating the novel way in which The Organizer manages to heartbreaking, funny, and endearing all at the same time. 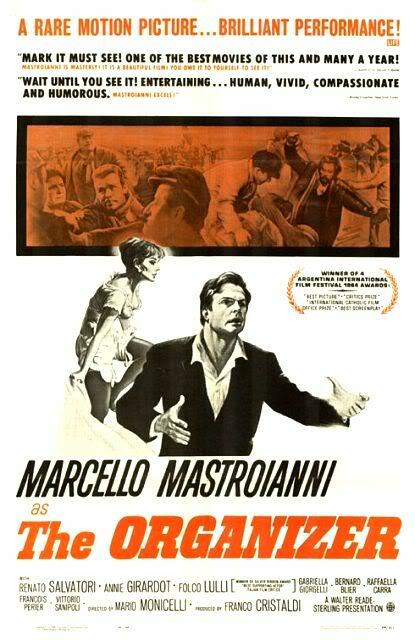 Monicelli’s deft blending of irony, humor, and tragedy coalesce perfectly in this sequence, involving a Sicilian, Salvatore Mustafah, who informs the strike committee that he intends to cross the picket line. “What are you?” the committee members ask from their second-story balcony. “A desperate man,” he shouts up from the dirt piazza below. Owing to his recent arrival in Torino, Salvatore is unable to secure a line of credit at the company store and consequently must work. However he doesn’t want to be disrespectful to the strikers so he respectfully informs them of his intentions. Their response is to beat some sense into him, but when they arrive at the little man’s place and quite literally knock the “door” down, they are so appalled by his meager living conditions that they immediately relent and grant him permission to return to the mill. He does so, but the bosses rebuff him and try to toss him back out onto the street, even going so far as to strike him. The enraged little Sicilian then whips out his switchblade (the one filmdom has taught us all Sicilians have at the ready), but alas, it won’t open. In one of the movie’s funniest moments, Salvatore throws the knife to the floor and stomps on it until the catch finally disengages and the blade pops free. But by then, he’s standing alone and the guards are on their way. Monicelli makes the moment intentionally funny, and we laugh whole-heartedly — until moments later when we see Salvatore frog-marched out of the mill in handcuffs, bound for jail and robbed of what little dignity he had left, and we realize that the poorest of the poor always gets the short end of the stick, and that the man with the greatest need, who risks the most, often fares the worst — and that we are laughing at him. But in the end the film is full of such moments, and we understand that Monicelli is neither manipulating us nor is he being cruel. He’s merely reminding his audience that there are times in life where we have to find the humor in the bleakest of situations, lest we give into despair. The Organizer is very hard to find, but it will reward those who know how to look.